Fitness Weight Training, 2014, 3rd ed. 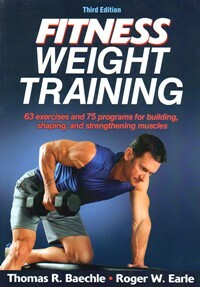 Fitness Weight Training was originally published in 1995. The 2nd edition was published in 2005. The first 2 editions of this book have sold over 125,000 copies and have been translated into 5 languages. Recommended for: It is targeted to the average weekend warrior. • Thomas Baechle, EdD, CSCS is the chairman of the exercise science department at Creighton University. He is the co-founder and past president of the National Strength and Conditioning Association (NSCA). For 20 years, he was the executive director of the NSCA Certification Commission. For 16 years, Baechle competed successfully in weightlifting and powerlifting. He also coached and taught weight-training classes. He has authored 15 other books, some of which have been translated into 10 languages. • Roger Earle, MA, CSCS has over 25 years of experience as a personal fitness trainer and competitive sport conditioning coach. Previously, Earle was the associate executive director and the director of exam development for the NSCA Certification Commission. In collaboration with Baechle, Earle was responsible for reviewing and editing the CSCS and NSCA-CPT exams. He received his masters degree in exercise science from the University of Nebraska. He was formerly a strength coach and a faculty member at Creighton University. In this 3rd edition, the authors summarize 63 specific exercises and present 75 exercise programs. These are grouped into 6 color-coded "workout zones" defined by your baseline level of strength. In general, this book is well done. The discussions are brief and each chapter is supplemented with subheaders, tables, and color photos to make the book visually appealing. The switch from black-and-white photos in the 2nd edition to color photos in this edition is a definite plus. However, the 3rd edition uses a sans-serif font throughout. (The 2nd edition used a serif font for the majority of the text.) I have always preferred reading print in a serif font, particularly when font size is small. I think the choice of a sans-serif font for this 3rd edition makes reading this text more challenging. Chapter 1 is a short chapter that introduces the principles of weight training. They also explain the 3 general categories of the weight-training programs they provide: "muscle toning," "body shaping," and "strength training." Although they provide clear descriptions for these categories, will the average weekend warrior understand the difference between "muscle toning" and "body shaping"? (Is there really that much of a difference?....the specific exercises for these 2 programs within a given color zone are nearly identical.) The last page of this chapter presents an anatomical diagram of the human body listing the Latin names of the major muscles. If you have read my reviews of other books, you know that, generally, I think it is silly to delineate the Latin names of muscles in a book intended for consumers. But, the authors kept this very brief. Chapter 2 is a short chapter describing weight-training equipment. Overall, the information here is good. I have 2 suggestions: On p. 11, the authors briefly discuss resistance bands. However, the explanation of the different levels of resistance, as it pertains to the color of the resistance band, appears in Chapter 4 (p. 33). I would prefer to see the discussion of resistance bands in Chapter 4 moved over into Chapter 2. Second, they should warn readers about not trying to lift too much weight while sitting or lying on a stability ball. Cases have been reported where someone was working out with heavy weights while using a stability ball and it exploded. Chapter 3 explains the 6 color zones. Table 3.2 (p. 21) summarizes them: 3 fitness levels (low, average, and high) for "Untrained" and the same 3 fitness levels for "Trained." Determining which of the 3 fitness levels you fall into is summarized in Table 3.1 (p. 19). Understanding how to use these 2 tables requires careful reading of the text. I think this task would be easier if these 2 tables appeared on the same page and were labeled "Step 1" and "Step 2". For Table 3.1, it would be helpful if the sub-header read "Men (80-lb barbell)" and "Women (35-lb barbell)" instead of just saying "Men" and "Women." Also, my assumption, when I first looked at Table 3.2, was that a person would progress from top to bottom in the "Untrained" category before shifting over to the "Trained" category. However, on p. 20, the authors state that your progression should be left-to-right, then down to the next line. Some simple directional arrows added to Table 3.2 would greatly enhance understanding their system. This is an important concept because several tables in Chapter 4 present info pertaining only to the "Blue-Red Zone". Again, I am confused: does this mean only the Blue Zone and the Red Zone, or, all of the zones between Blue and Red? Answer: the latter is correct. Thus, you must understand how to progress through their color zone scheme in order to interpret and apply the information provided in these tables in Chapter 4. Rewording the tables' headers from "Blue-Red Zone" to, instead, "Blue-to-Red Zones" would help. And, if workouts are to be grouped according to color, then, why not list a series of colored dots for tables like this? This would help the reader identify if it pertains to them or not. In summary, it took more effort to extract the intended concept from these pages and tables than should be necessary. More careful content development and editing would have made this an easier task. Chapter 4 provides the details needed to design a custom weight-training program. It lists specific conversion factors for how much weight you should start with, relative to your body weight, for each exercise. This chapter is well-done. Chapter 5 explains proper weight-lifting technic and shows several stretches. This chapter is well-done. Chapter 6 is the longest chapter: 88 pages. It provides explanations and photos of exercises for every part of the body. The book subdivides these exercises by using horizontal red banners. This is confusing....at first, I thought that these exercises were only for people who qualified for "red zone" exercises, as summarized on p. 21. A color other than the colors used for the 6 zones should have been used for these subheaders. Chapters 7 - 12 present specific exercises for each of the 6 color zones. The top of each page displays a banner in the color corresponding to that zone, and, these colors can be used like tabs to quickly find the chapter that corresponds to the color zone you are looking for. Within each of the 6 color zones, exercises are grouped into "muscle toning," "body shaping," and "strength training." • the safety of several of these exercises has been questioned: bent-over rows (p. 70 and 73), and performing leg-press/squats on a machine in a seated position (p. 111). Bent-over rows, as demonstrated on p. 70 and 73 can strain the lower back. The preferred method is demonstrated on p. 77 (and the front cover!) where a single dumbbell is used and the non-exercising arm is placed on a bench to support the spine. Likewise, if too much weight is used on a leg-press/squat machine, the seated position can force the coccyx to curve as the knees bend, potentially injuring the tailbone. For this exercise, a standing position is preferable. Also, within these specific exercise routines, the authors use abbreviations like "DB," "KB," and "SB". It took me several minutes to figure out what they mean. (definitions are provided in Chapter 6, p. 47 and p. 49). It seems like it would be more logical to combine dumbbell, kettlebell, and barbell exercises into one column and rename it "Free Weights". Regardless, the definitions for these abbreviations should appear on the pages summarizing the specific work out routines. Chapter 13 explains how to design your own weight-training program. This chapter is very well done. It provides the salient concepts succinctly. Chapter 14 discusses combining aerobic exercise with weight-training. An omission here is the failure to discuss that many years of weight-training (and no aerobic exercise) can lead to a decrease in vascular compliance (Miyachi M, et al. 2004). Aerobic exercise has the opposite effect on vascular compliance. Thus, combining both types is important. Chapter 15 is only 2 pages long and doesn't contain much useful information. • Photos & Illustrations: The photos in this edition are excellent. They show average people performing the various exercises. Photos of people performing stretches are also provided. The 2nd edition of this book included black-and-white photos; in this edition, they are all color. This is a nice improvement, however, all of the subjects in this 3rd edition appear to be in their 20's and 30's whereas the 2nd edition included some photos of older subjects. Books like this should include photos of older subjects to help reinforce the importance that resistance exercise is not just for younger people. • Tables & Graphs: There are many tables throughout this book. Except for my concerns noted above, generally, these are well done. In addition, if you obtain the e-version of this book, you can download a printable version of your workout chart (see p. 25). • Documentation / Accuracy: This is not a scientific book, so, it does not cite published research throughout. However, at the end, the authors list 15 publications, 4 of which they co-authored. • What I Liked About This Book: One of the strengths of this book are the 75 specific workout routines. Each routine summarizes the muscle group being exercised, the number of reps and sets, and options for performing the respective exercise on either free weights, a machine, or an alternative method (eg., body weight, stability ball, etc). This is a very nice feature, as it gives different approaches to any particular exercise. The blank charts in the Appendix are nice. Readers can photocopy these. • What Could Be Better: In general, I like the concept of presenting exercise programs according to fitness level, though I think the presentation could be simpler: group all the free weight exercises into one column, provide definitions for the abbreviations, and, consider collapsing "muscle toning" and "body shaping" programs into one category. Include images of older adults, and, compose a chapter discussing resistance training as it applies to older subjects. Use a serif font for greater legibility. In summary, although "Strength Training" is still my favorite consumer book on this topic, I think that "Fitness Weight Training" is a very good book. As with the 2nd edition, Baechle and Earle have produced a resource that is very useful for the average person who wants to know the correct way to train with weights. It covers everything a novice weight-trainer needs to know and does so in a format that does not get into too much research. I highly recommend this book for weekend warriors and any others who want to begin a weight-training program. Copyright ©2014 AthleteInMe, LLC. All rights reserved.